Songs of Joy by James Tissot, ca. 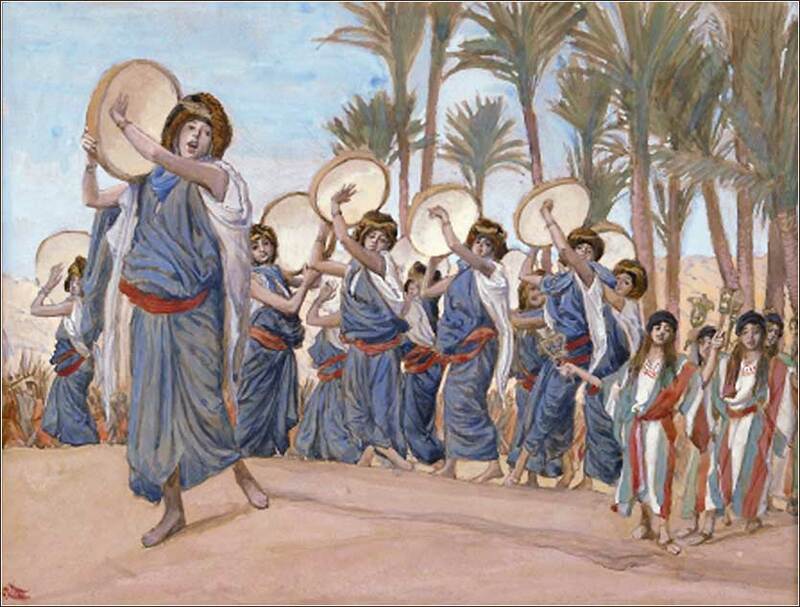 1900, shows Miriam, leading a group of Hebrew women and girls, dancing with tambourines to the "Song of Moses". I pray, O God of hope, for all persons and families whose lives are torn and disrupted by drugs and alcohol. Enable them to identify the illness. Strengthen them to seek help. Bless them with the power of your love, which imparts transformation and wholeness to those who trust in your name. Grant that as they walk this tortured road, they may journey together and bound close in the bond of love. Shine your light upon them, Lord Christ, that they may see the path out of their misery, and give them the strenght to follow it. 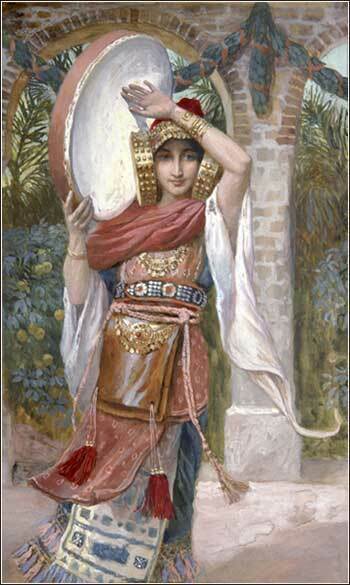 Jephthah's Daughter by James Tissot, ca. 1900. Then Moses and the people of Israel sang this song to the Lord, saying, . . . The dancing of the medieval ladies from this Nuremberg Bible illustration (c. 1400) is a bit more sedate than Tissot's dancers, above. Full size. Exodus is a popular, fascinating, and enduring Bible story, but often we do not fully understand why. If we read the second half of the Song of Moses and let it sink in a bit, the meaning of Exodus and the meaning of life begin to coalesce, for it is the story of every person seeking God, the overarching story of the Bible. God has seen fit, in his graciousness, to manifest Himself to us repeatedly throughout the ages; and the reason He comes is to lead us to the place where He lives. We are mired in slavery. And the power which binds us, call it mortality or Satan or what you will, is indeed powerful. It is immediate. And we are used to it and fear to abandon the "obvious" way to live, the path of least resistance, a life that often seems to consist largely of trying to crawl to the top of a cage of angry rats. The song, note, reads "You have guided them to your holy abode," even though the Hebrews have just begun their arduous journey. God has come to them, as Christ came to us, but — for reasons we cannot hope to understand — He does not just snap His fingers. If that was God's will, life on earth would hardly need to exist. The Hebrews will have to struggle, suffer, and fight over the course of forty years even to begin their habitation of the Promised Land. And in this time, they will have to have utter faith in God, and worship Him in faith, for their very lives depend on Him. Ours do also — but it is immediately visible to the Hebrews, who are stuck in the middle of a hostile desert without much food or water, surrounded by aggressive and pitiless armies, larger and stronger than they. Once we realize that we are in the same position as the Hebrews, wisdom comes. We blind ourselves to our fragility; but like the Egyptians, we live solely by the direct intervention of God, on the edge of a vast cosmos that could annihilate us in an instant. Jesus came to take us home, to His home. We live in faithfulness, relying on His promise; and Exodus gives us heart. For the journey of the Hebrews was long and arduous, but as He always does and always will, God kept His promise to them.